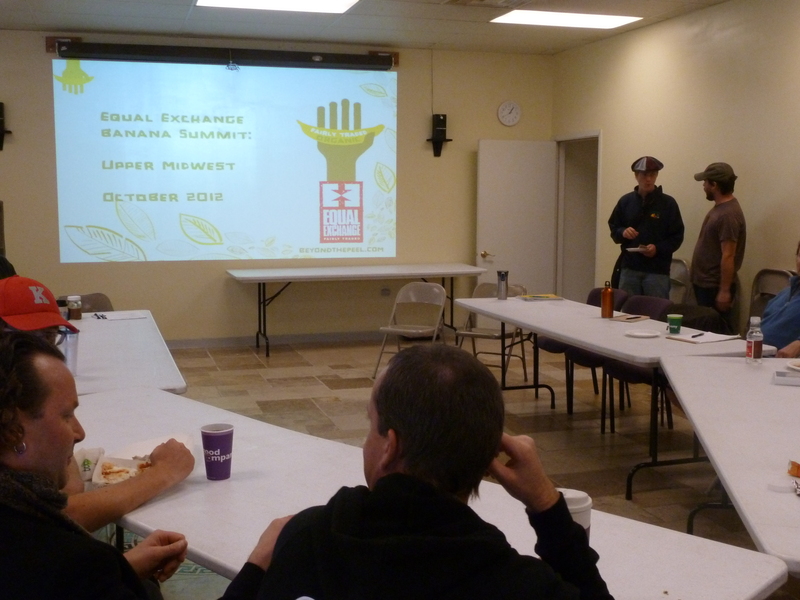 The Twin Cities Hosts a Banana Summit | Small Farmers. Big Change. 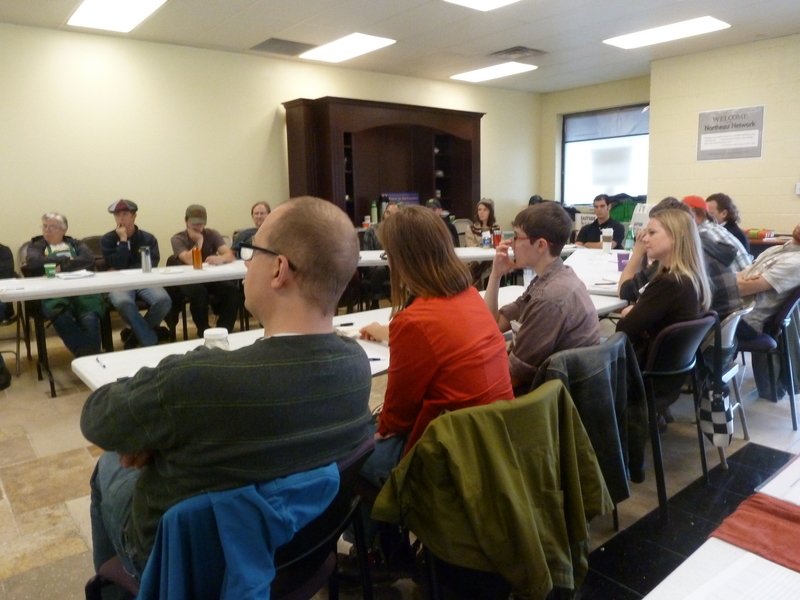 On Tuesday October 23rd 2012, 25 people representing 13 co-ops, 2 distributors and one importer (Equal Exchange) came together in the Twin Cities for a small farmer banana summit. 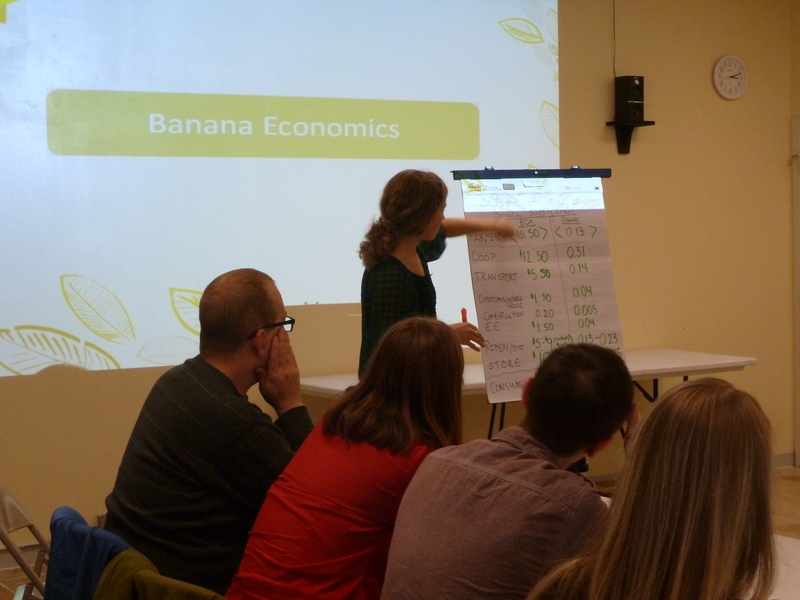 The group discussed the challenges and successes in the small farmer supply chain in order to deepen support for and expand reach of Equal Exchange bananas in the Upper Midwest. 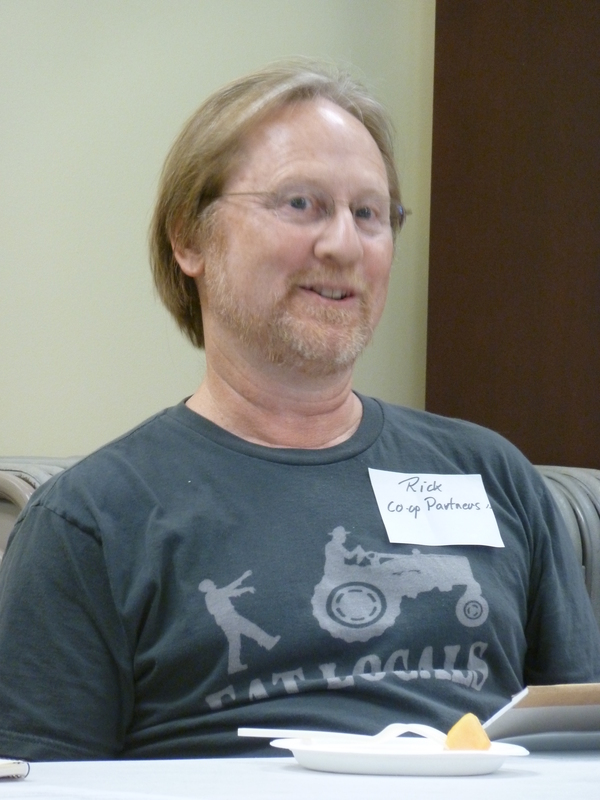 Rick Christianson of Coop Partners Warehouse, (CPW) one of the first supporters of the Equal Exchange banana program in the Twin Cities, gave this speech as part of the summit. His words encompass a lot why we do this work at Equal Exchange. I’d like thank Equal Exchange for holding this event. 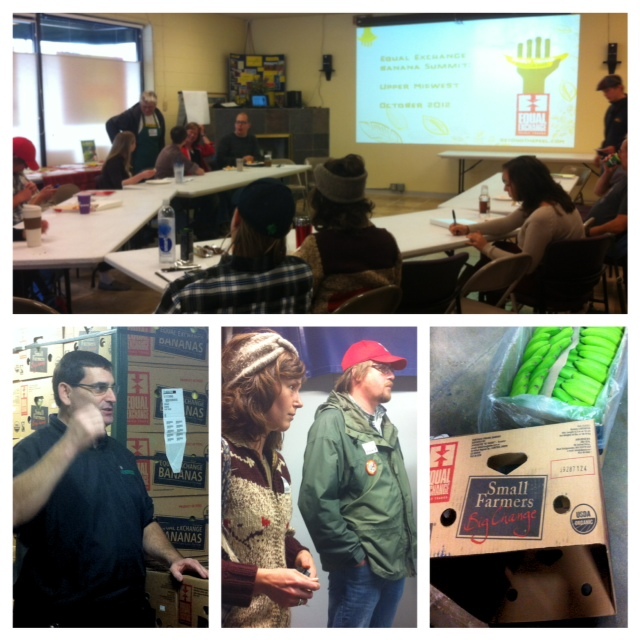 And East Side Co-op for hosting us here today. I’d also like to express my appreciation to J&J for putting us in their gas chambers—er banana rooms this morning, and for partnering with Co-op Partners in this banana program for all these years. When the idea of a Banana Summit was first mentioned to me, it brought up images of a mountain top covered in banana peels. So everyone please watch your step. When I started working in the organic produce game organic bananas were no where to be found. There were only rumors of them on the west coast. The conventional banana business was an ugly and bloody political nightmare–about as opposite of Fair Trade as you can imagine. But we in the young co-op community had no idea how to utilize what little buying power we had to try and make a difference. So we scrambled around trying to find something more palatable to our fledgling little world of impoverished idealists. In the early 80’s we finally managed to figure out how to get organic bananas to the Twin Cities, but it was a logistical nightmare. The bananas were grown in Mexico, and trucked up to Los Angeles. They were gassed there, 2000 miles away. The pallets were then wrapped in paper and put on cold, 36 degree produce trucks for the 2-3 day journey to Minnesota. Every load was a gamble against time and temperature. My memory may be exaggerating things, but it seemed that about a quarter of the time the bananas would arrive chilled–a lovely stage 2 gray-green. About a quarter of the time, they would come in sweating and cooking—exotic leopard skin bananas with black and yellow the only colors in sight. And even when the bananas survived the trip OK, everyone that dealt with them had to keep a lookout for the black widow spiders that seemed to love hiding the wooden crates that the fruit was packed in. Banana summit attendees listen and debate about the future of small farmer bananas. For the most part, we lived with that system for over twelve years. So after experiencing those early years, what we have now seems like banana heaven to me. We really are incredibly fortunate to have an organization like Equal Exchange doing the great job that they do to get us a quality product that has been well cared for all along the line, that has the force of social justice behind it, and that is in keeping with the values that the co-operative community has worked so hard to establish. The day to day tasks of our work often can serve to cloud our vision of the larger picture. But the relationships that have been forged between farms, wholesalers, retailers, and consumers in this area is an accomplishment that we all should be proud of. You may or may not realize it, but especially in produce, the co-operative culture of the Upper Midwest has created a growing alternative food distribution system that is very much the envy of many in the sustainable agriculture world. It is a model that continues to thrive despite strong competition from establishments with far more economic clout than we have. As one who has been in this game since the Pleistocene, I have been privileged to see and be a part of a the ever expanding organic and co-operative movements. But while the business end of the organic world has thrived, it often seems that some of the heart was lost in the process. As a buyer at CPW, I try very hard to keep heart in its rightful, prominent place in the equation. With regional farmers, we have developed a delivery system that goes well beyond the usual buy-sell dynamic between farm and wholesaler. For product from other growing regions, wherever we can, we focus on farms that build both their soil and their communities…that care about their workers and treat them well. Farms that maintain their integrity on all levels of their operation. Through the years, I have been privileged to befriend and develop relationships with an ever growing number of wonderful, dedicated, innovative, brilliant, but down to earth people on farms all around the country. When it comes to product imported across the water, the barriers to keeping strong connections to people and the land are enormous, and it is wonderful when we have the opportunity to partner with others in order to help keep our reality in line with our vision. So personally, and in a business sense, I hope that all of us can realize how valuable it is to have Equal Exchange there for us to establish and maintain the connection between the real people at both ends of this trade line. Bananas are a big part of all our businesses. And thanks to the efforts of the growers in Peru and Ecuador, and the work of Equal Exchange, and J&J, we have a product on our shelves that is not only a big seller, but it has its heart intact. The co-op community of the Upper Midwest really is a shining star of a model that shows that it is possible to thrive in business while maintaining integrity and caring about social justice. Having truly Fair Trade Bananas is key to our continued success on many levels. I’d like to thank Equal Exchange for making this a reality and working so hard to maintain it. J&J Ripening tour; Banana Summit Attendee’s debating the future of bananas; Abbey Rae (East Side Food Coop) and Erik Larson (St. Peter’s Food Coop) listening intently.